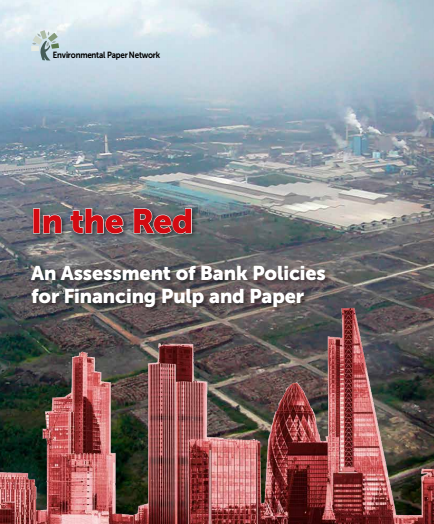 The Environmental Paper Network (EPN)* has published In the Red, an assessment of bank policies for financing pulp and paper companies worldwide. This assessment reveals that the banks most deeply involved in the pulp and paper sector do not have public policies that will ensure they avoid financing projects and companies that cause environmental and social harm. The assessment studied how ready the financial sector is to manage the environmental and social risks of financial involvement with the pulp and paper industry. It is a benchmark assessment carried out by a team of researchers from several countries, which evaluated the pulp and paper policies of 42 private banks against the requirements set out in 2016 in Green Paper, Red Lines. The Red Lines are regulatory, environmental and social criteria, which articulate minimum requirements that pulp and paper companies must meet before investment in them is considered. Unless pulp and paper mills and their financiers fulfil these requirements, they are highly likely to cause social and environmental harm and become the target of campaigns by civil society organisations. Member organisations of EPN therefore expect financiers to stay clear if their client pulp and paper companies are unable to meet the minimum requirements. The unacceptable level of relevant policies in financial institutions clearly demonstrates a lack of accountability and commitment regarding these issues. * EPN is a global network of more than 140 non-governmental organisations, working on pulp and paper sustainability issues, all of which endorse the Global Paper Vision. Copyright © 2015 中国环境纸张. All Rights Reserved.